I think I was Mexican in a previous life, I love Mexican food, especially; verde. Now with the gallstones, I’m constantly trying to be able to still enjoy the foods I love without meat, dairy or fat. 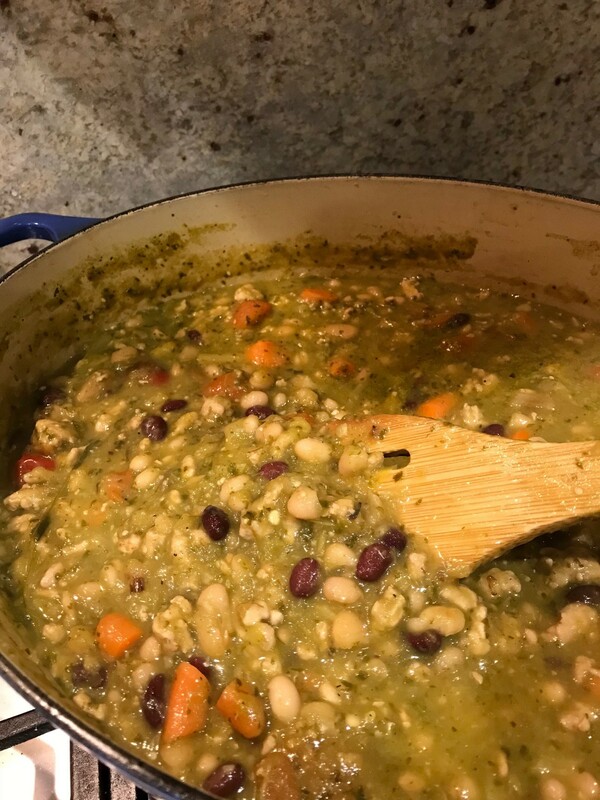 This recipe is just that, the flavor is absolutely delicious, my family had no idea they were eating something so healthy. 1-2 jalapenos depending on the spice level you like. You can also scrape out the seeds to reduce spice if need be. Don’t touch them with our fingers to cut, I use a fork and knife, and it’s saved me some grief. 1 box organic chicken, turkey or vegetable broth. You may or may not need the whole thing, this will depend on how much Verde sauce you want OR the consistency. Cover a cookie sheet with tin foil and spray with non stick spray. While your oven is heating up peel your tomatillos from their husks. Don’t be freaked out if you’ve never cooked with these before. They are a little sticky/tacky. Once you peel them you can either rinse them off or take a damp cloth and wipe them down. What I tend to do is peel off the husk and then twist it off on the top so you get rid of that top nub. Kind of like when you peel corn and then you break off that bottom piece of the husk. Put these guys either on the cookie sheet or in the large bowl. Rough chop all of your other produce (besides the tomatillos and the cilantro), you can even smash the garlic and peel it. When I say rough chop I’m talking 1 inch hunks and you can just cut the Poblanos into thirds. Once everything is peeled and chopped, throw it in the bowl, or on the cookie sheet. I find I make less mess when I use the bowl. So take your chopped veggies and whole tomatillos in the bowl drizzle with olive oil, and salt and pepper. Toss it with your hands and then dump the whole thing on a cookie sheet and use your hands to spread it out. Place the cookie sheet in the oven for about 30 minutes, give or take it just depends, it will smell delicious and there will start to be a collection of juice on the bottom of the tray. 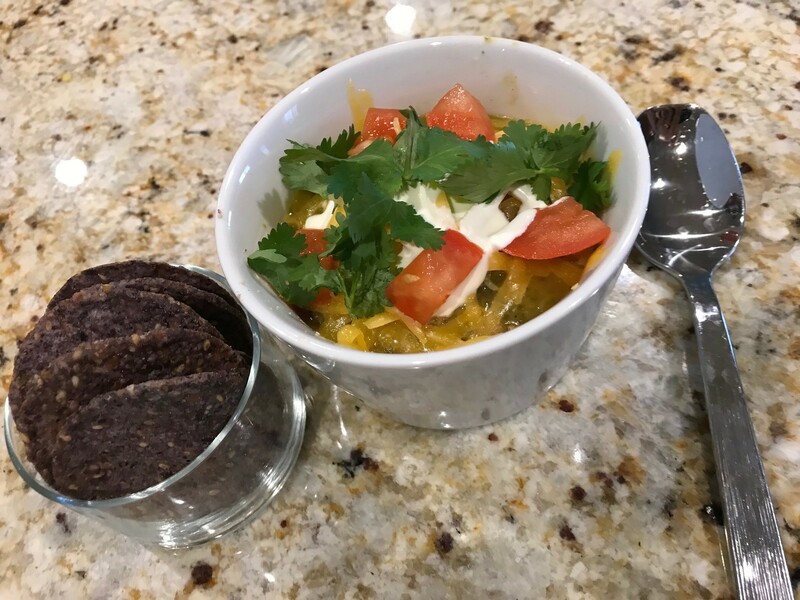 Remove from the oven and take about half of the roasted veggies and place in a blender, add to that a cup of the stock and half of your bunch of cilantro. Blend in smoothie mode, and pour into that bowl you tossed the veggies in. Repeat for the remaining veggies, cilantro, and broth. If you want the consistency to be runnier or you have a lot of guests you can use that whole box of broth.